This past November, Women’s World Banking’s chief product development officer Anna Gincherman and I attended the “Empowering Women throughout the Agribusiness Value Chain” workshop hosted by the Multilateral Investment Fund (MIF) at the Inter-American Development Bank Group. Connie Kolosavry from Café Femenino, Katherine Arblast from MEDA, Daniella De Franco from Technoserve, and Anna were part of the panel, “Increasing women’s participation in agribusiness: lessons learned and results,” sharing their key learnings and experience providing services and training for women in Latin America. Women’s World Banking was present to share the insights and outcomes from our recently concluded project expanding enterprise loans to rural women in the region, a project supported by MIF. 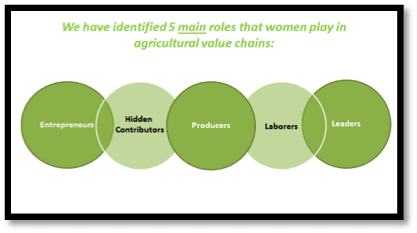 A common theme discussed by the speakers was the idea that women are not recognized for their role in the agribusiness value chain. Furthermore, they face challenges that are often linked to their gender: lack of access to education and training, and most importantly socially imposed restrictions on the role they play in their family and community. Café Femenino works with Peruvian female coffee growers who are often uneducated and isolated. These women grew coffee their whole lives but their role as laborers and as producers has been mostly hidden in the agricultural value chain. To create a market for the women-grown coffee, Café Femenino branded the coffee that the women grew and established regulations that laid out requirements for roasters who want to sell the coffee. Café Femenino also uses a unique payment system that pays a premium directly to the women for the coffee they produce. The results? A viable market where the women receive fair financial compensation and own the title to their land. Connie noted that with money in their hands and a shift in their roles from laborers to land managers, the women felt an increase in confidence and power within their households. This is an outcome that Women’s World Banking has seen time and time again in its work: providing access to a savings account or a loan in her name is an important step in giving low-income women power and independence. In her work with mango growers in Haiti, Daniella from Technoserve found that women have little incentive to grow their business. Burdened by daily responsibilities, it is hard to make time and effort for the training that would help them expand their business or optimize their operations. Thus, it was crucial for her staff to provide workshops at a convenient time for the women while convincing their husbands to take on some of her tasks such as washing mangos. In the field of microfinance, Anna from Women’s World Banking noted that providing incentives to loan officers is equally important. Shaped by the prejudice that women don’t have money to save, loan officers often have little motivation to speak to women. Providing training to loan officers to raise awareness of this bias and setting targets for female clients within the institution are ways to begin to close the gender gap. Gender is a collection of socially defined attitudes and perceptions towards how men and women should behave. Having men and women interact in the same environment at the same time is one of the most effective means to help them become aware of, and rework these attitudes. Katherine from MEDA talked about her experience in providing trainings in technology to rural farmers from four cooperatives. During the workshop, men and women were asked to cook together and a significant number of men realized for the first time that they had never cooked! Similarly, Women’s World Banking found that in the process of creating marketing materials for ¡Nde Vale! a loan offered by Interfisa Financiera (Paraguay), an implementing partner of our three year rural project in Latin America, women related the idea of having power more to the image of a woman standing with her family behind her than an image of a woman standing alone in the picture. “Addressing gender gap is not a zero-sum game,” said Women’s World Banking’s Anna. Indeed, both examples show that the task of empowering women is not simply to kick men out. Rather, women can gain power in the household relative to their husbands. For this to happen, it involves an enduring process of changing the women’s, and the wider community’s gendered perceptions of their roles in the community. And this cannot be achieved by one institution alone. At the conclusion of panel, Anna noted that addressing gender disparity and empowering women involves building linkages between different institutions to create a viable ecosystem. The discussion was certainly a start but ultimately left with the question where should the linkages start and who should take the lead?